1. He wears a brightly colored costume. 2. He hides his identity behind a mask. 3. Uses a special weapon (silver bullets). 4. Has unusually good marksman abilities. 6. Has an eye-catching mode of transportation (his white horse, Silver). This show, besides its serious storylines, is often very funny. I don't think it was meant to be as funny as it was, but it's very enjoyable nonetheless. 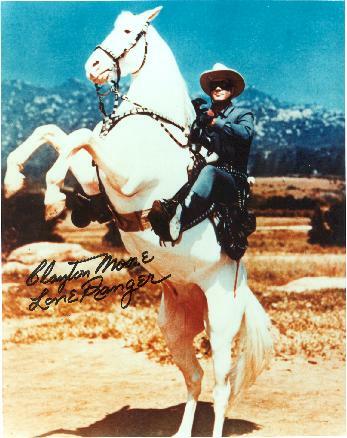 Clayton Moore is wonderful as The Lone Ranger. I like the way his voice sounds. In real life, that is not the way his voice sounded. 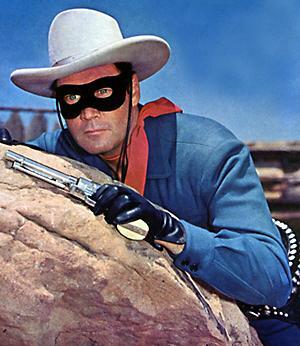 Moore made his voice sound like that to emulate the Lone Ranger character from the earlier radio show, as played by another actor. He even answered his telephone using his Lone Ranger voice. It's funny in a Dudley Do-Right kind of way. 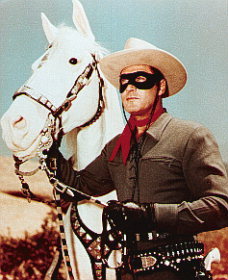 And we all know the Lone Ranger needs Tonto. His faithful Indian companion always has his back. Jay Silverheels did a fantastic job and I love it when he beats the stuffing out of the bad guys. The stereotypical Indian persona with the broken English was a bit forced, but back then, that's how TV and movie producers thought people liked seeing Indians. Tonto is a great character, but it would've been great if they let him speak a little plainer. After all, if he's an Indian who knows English THAT well, I think he would be a little more familiar with the proper syntax. But the most important thing to keep in mind is that these are fun shows. They don't have any gore, and the heroes are positive heroes. 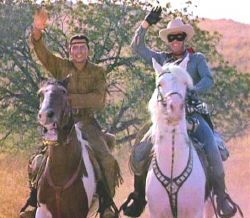 The Lone Ranger and Tonto always do the right things for the right reasons. They're not borderline bad guys like a lot of the movie and TV heroes we've seen in the years since this show last aired. And above all else, the story concepts are very clever! CHECK OUT THE PBDEN CHANNEL ON YOUTUBE FOR THESE AND OTHER GREAT VIDEOS!